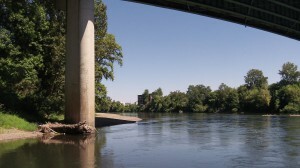 The Willamette River, where clean-water rules may have to be revised. Albany borrowed and then spent upwards of $70 million in recent years to comply with clean-water regulations on the Willamette River. The city modernized and expanded its sewage treatment plant and constructed the “Talking Waters” wetlands project. Now there’s a possibility it may not have been enough. The city council is getting a report Monday on the latest developments in regulations affecting Oregon waterways. As a result of a federal court decision last year and a new lawsuit filed by an environmentalist organization, rules on the allowable temperature of the Willamette River may have to be revised and rewritten, the report to the council says. These rules were part of a regulatory scheme called Total Maximum Daily Load, adopted in 2006. No one knows if this will happen, but if the regulations are made even more difficult to meet in to keep the river cooler in the summer, Albany may have to do more than it has already done to comply.